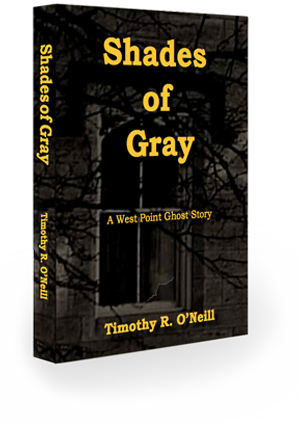 There is a ghost in the barracks at West Point, and the brass is eager to make it go away. Two officers from the Department of Behavioral Sciences and Leadership are assigned to do the job: Sam Bondurant, a human factors engineer and Liam FitzDonnell, a clinical psychologist, reluctantly take on the task, not guessing how daunting and ultimately terrifying the project will be. Assisted by Sam’s scholarly and fanciful wife, Maggie, they find themselves caught in the consequences of a terrible moment in 1830 and the tormented souls it has left behind. Nothing in their military experience or education could prepare them for the results. Liam stomped down the hall and picked up the telephone. Ortega listened. There was a short silence, then Liam said: “Jesus, Sam. What is it?” Another silence, then Liam ran down the hall. “Come on, Ortega, the cadet’s having a seizure.” Ortega bounded up and followed Liam to the door of the plebes’ room. Liam turned the knob, pushed the door open abruptly, and took half a step in, then backed out again as if he had been roughly shoved. He stood there in the doorway, staring into the darkness. Ortega was very quick to guess what had happened, and looked past Liam into the room. He saw nothing but the dim shapes of bunks, desks and a partition between the cadets’ alcoves. Liam had been poised on entry to turn sharply right, toward Carson’s bunk. While trying to get a visual fix on the far alcove to make certain he did not go careening into unseen obstacles at a dead run, he had seen something that was now ineradicably etched in his memory. Ortega tried to look around Liam into the darkness of the room, but recoiled violently back into the hallway as he felt something unseen rush out of the door and surge past him. He felt nothing but a chilly movement of air; but he knew without really seeing that something had come that way. He later claimed that some people have more than one set of eyes, and his spare set was formally opened at that moment. Liam felt it as well, but his attention was directed at the shadows near Carson’s alcove. He recognized it in an instant. It was a subtle, indistinct, faintly luminous form. But something lay unused inside Liam FitzDonnell as well, hidden perhaps in centuries of ancestral memory and awakened abruptly in him by the sudden and unsought confrontation with a force that flaunted its contempt for rational thought and gathered about it the Host of the Air, the tattered, gray-shaded phantoms of unreason. There was no doubt, no hesitation; the somber demon of his hidden soul recognized it for what it was, and he felt the physical cold travel over his body. It was standing at the foot of Carson’s bed, but it had turned and was looking at Liam with a dark intensity. He could see the eyes clearly, eyes that looked at him from the next world, eyes that said You know, you must know, you dare not look away. They were sad eyes, eyes that refracted the light of grief and loss from an infinite remoteness; they were crystalline lenses that subtly reflected the pure light of God, blended the rainbow of creation into pure white crystal shining specks of stars, glistening foci of all the losses of a sorrowing world. It was not, after all, a tall figure, but its cloak made it look like a hovering presence that ruled the darkness. The cloak sparkled on its shoulders as if wet with dew; it seemed to hang open in front, but its edges were not clear enough to discern. Its head was turned toward Liam, and he knew he was somehow dimly perceived by the thing. For no reason he thought of it peering at him through a smoked glass, faintly sensing Liam’s substance. The eyes knew him, and there was something in them that Liam feared, that he had feared from the start: an entreaty, perhaps; a call to arms. Liam saw a darker shape beyond this figure, partly blocked by the alcove wall. He was prepared for the more terrible presence he had abstracted from the cadets’ dreams, but it was not so; the darker presence waited patiently while the other eyes held Liam in thrall. The figure stepped back from the cadet’s bunk and turned away from Liam, then walked slowly toward the wall. It moved clumsily, almost like a cartoon crudely animated. As it moved away, the hidden shape moved into its place, and Liam reached out with his hands; but the shape turned away and vanished. Then, as Liam backed out of the doorway, the room was filled with dancing points of light, and the points circled faster and faster, scurrying flakes of pale luminescence, whirling around a center where there glowed a tiny light, the light of distant stars, the reflection of the light of heaven. The whirling fragments, as if summoned by a cry beyond the limits of mere human sense, spun away through the circling vortex and, one by one, streamed through the wall over the bed. And the room was cold.